Here is a wickedly easy dish you can make for a huge Sunday family gathering. It is delicious, relatively easy to make, and heart-stoppingly good – literally and figuratively. The original recipe comes from a Nora Daza cookbook, but I have altered the recipe somewhat. Start with two large whole pata or pig’s feet, the front legs. This will make enough for 6 hungry diners. Wash the pata very well, give it a pedicure if the nails totally turn you off, or if the queasy type, remove the small piece that includes the toes or is it hoof? Stick the two patas into a pot where they fit nicely (not too loose and not to snug), pour in a cup or so of good apple cider vinegar, a couple of bay leaves ( I used a combination of fresh leaves from the garden and some dried), 20-30 lightly smashed peppercorns, about 20 cloves of garlic and water to cover the pata and bring to a boil, uncovered. Remove any scum that rises to the surface and keep on a gentle gurgle until the patas are tender, ours took roughly 1.5 hours. Turn the patas over once in a while and add water as needed and keep them a nice gentle boil. In the last half hour of the boil, let the liquid reduce a bit, so that perhaps you end the boil with liquid about halfway down the pata. You don’t want too much liquid, nor too little. Carefully remove the patas and put them on a plate, strain the liquid to remove the bay leaves, peppercorns and garlic and return the strained liquid to the same pot, add back the patas and turn the heat back on. Add about 3/4 cup of good brown sugar (muscovado if you have it), about 1/2 cup of soy sauce ( I used half Kikkoman, and half dark local soy sauce), some freshly ground pepper and about 3/4 cup of dried banana blossoms that have been pre-soaked in hot water. Let this all simmer for about 10-15 minutes and serve piping hot. Ms. Daza suggests serving this with fried bananas added to the stew in the last 5 minutes. I understand the added layer of starch and sweetness, but we skip this step. This is delicious with steaming hot white rice. Have a vegetable ready to help you justify eating something so incredibly rich and delicious…but so easy to make! Enjoy! This is indeed delicious with the skin and fat rendered from the pata cooked in a time-honored slow braising fashion – nothing can go wrong with this dish! I thought my grandma called this dish estofado or I could be wrong but the addition of sugar clues me it is estofado but the other spices are missing cinnamon stick and star anise in the estofado I am familiar with. Yes, the addition of fried ripe saba not the mushy ones are the knock out punch! MC, yes, a cinnamon stick or star anise gets this closer to the Chinese Pata Tim… either way, delicious! my nora daza cookbook is like 20+ years old, i think… ( it became my teacher in the kitchen when i was stil learning to cook during my stay in the US) the recipes are so good and seemed like they were really kitchen-tested. this is one of my faves as a child, gelatinous pata with its sweet and salty taste. however, as i got older, it tend to lean on eating more vegetables, or so i try…the pictures looked so appetizing though, as always. This reminds me of Pata Tim a lot, which my mother would prepare for Chinese New Year. Does anyone know where I can get dried banana blossoms in NY? MM, what do you think about cooking this in the pressure cooker? It would save a lot of time and gas. The scum sticks to the side of the pot and I just remove it when it finishes cooking. My Mom is using pressure cooker all the time. Saves us money on fuel and the meat is very tender. Adding brown sugar, whole peppercorn, dark soy sauce and apple cider vinegar provide more taste and appeal. The gelatenous sauce is indeed making it really appetizing. Yum yum!! Really, MM? The scum affects the taste of the broth? how about using a slow cooker? I know this recipe as paksiw na pata which my spinster aunt used to cook, minus the brown sugar (which made it more akin to adobo than paksiw then, don’t you think?). 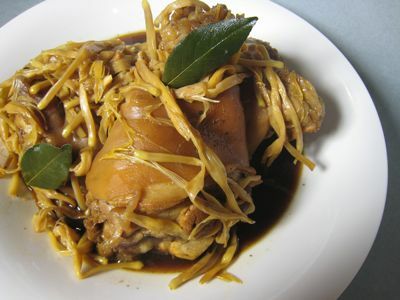 What makes your pata recipe distinct from the Chinese pata tim is the banana blossoms. Pata tim has almost the same brew for a sauce, but for the addition of star anise and shiitake mushroom. I use a pressure cooker to cook pata tim or paksiw na pata. I guess I am not such a stickler for the fine nuances of taste differneces between slow-cooked and pressure-cooked dishes, hehe. But I did notice, though, that the sabaw of nilagang baka or bulalo is not as tasty pressure-cooked as the slow-cooked one â€“ lalo na if woodfire is used. Mas malasa talaga. I always used to do this with recipes that call for soy sauce. I found Kikkoman too salty (before they came out with the less salty version), while I found the flavor of local soy sauce lacking in smoothness. I discovered Golden Swan soy sauce (yes, made by Silver Swan) years ago and the taste was the approximate Kikkoman-local soy sauce combination that I made! Sadly, it is no longer in the market. I keep on hunting for it in supermarket shelves, just in case they have leftover stocks. Then I make pakyaw. I haven’t been able to find any lately. Haaay, I am down to my last few botttles. i mix in the soy sauce and sugar from the very start. don’t know if it makes any difference adding these last two ingredients towards the end of cooking. i think putting them in from the beginning contributes to a happier mingling and absorption of flavors, and the sugar helps make for a thicker (syrupy) sauce. Millety, I was about to say too that I put the brown sugar or muscovado with the soy sauce from the very start. Hmmm…will try this Marketman’s version of Nora Daza recipe. I love this and crispy pata too! Paksiw na pata is a family favorite. (I love the banana blossoms more than the pata!). Like Tricia and Milletty, I also add in the sugar together with the vinegar, soy sauce, garlic and cracked pepper. Gwiz, i also miss Golden Swan soy sauce. It was really better than the regular Silver Swan. I am also a Golden Swan fanatic. I usually get my supply from Robinsons supermarket. Sometimes I also find them at the shelves of Rustan’s Fresh supermarket. Just before Christmas, there was a lot of golden swan soy sauce at the grocery of Plaza Fair at the Makati Cinema Square. I do hope you get your supply soon. I just made this last Saturday morning, using a pressure cooker and it worked wonderfully. With two pigs front feet cut up, i’ve been adding 1 cup of vinegar, 3 dried bay leaves, about 10-15 whole peppercorns, 1 whole garlic smashed and skins removed, i also add 1 cup of dark brown sugar, 1/4 cup soy sauce and 1 bag of dried lily flower (substitute for banana blossoms since they are hard to find here in the bay area), then add about 3 cups water. Pressue cook them and once the steam starts to make noise, time it for 30min and walla. I never crack my peppercorns, but might try them sometime. MM can i use fresh bay leaves? If so, how many leaves? MM, is this the same as humba bisaya? I’m trying your recipe tomorrow. My Lola Siniang, who’s a terrific cook, calls this Estofado. At 96 years old, it’s understandable if she forgets people, places and events but it’s really incredible that when you ask her how to cook Estofado, she still knows it by heart and can give you the procedures step by step! She said that the vinegar, soy sauce and sugar should be placed at the start in order for the flavors to blend very well. Hi everyone, I think there is possibly a difference between having the soy sauce in early or later. The purpose of the front end of the recipe is to tenderize the meat. With salt (soy sauce) in the broth, the boiling temperature of the liquid will be higher, and possibly have a tendency to toughen the meat, unless you watch the fire carefully and make sure it is just simmering. Once the meat is tender, the soy sauce and sugar are added to made a quick braising liquid and sauce to serve with the meat. I understand the desire to stew the meat for an hour in the soy sauce, as adobo is sometimes done, but you MAY want to try making adobo with just vinegar water and garlic and peppercorns until tender, then add the soy sauce for the last 10-15 minutes… and see for yourself if there is a marked difference… Until several decades ago, toyo in adobo was a RARITY, and it is only recently that the majority of cooks add it, probably as a short cut to enhancing flavor. An adobo without toyo is quite good if properly done, frankly. In Cebu, we call this humba. And yes, MM, my mother prepares this with salted black beans. Although she uses short ribs sometimes (with the meat fall-off-the-bones soft once cooked), our preference is the pata. The great thing about this dish is it tastes better with every re-heating as the sauce further penetrates the meat. New Yorker, try International Market on Mott Street in Chinatown, they may have some dried banana blossons. Lily is a very good substitute. We have another version of the paksiw na pata which we call Tayuba. The sugar is caramelized before adding all the other ingredients. We also add whole and shelled hard-boiled eggs just after it simmers. The eggs take on the brownish color of the soy sauce when done. The Tayuba when done has a slightly sweet flavor which blends well with the paksiw taste. We also add whole black mushrooms too. YUMMY!!! My spinster aunt also swore by Coconut brand soy sauce. She used it for her bistek tagalog. Which brings me to our tagalog (particularly Bulacan) version of adobo. We do not use soy sauce as salting ingredient for adobong baboy (though it beats me why we use soy sauce for chicken adobo!). We use patis. People to whom I have served the tagalog adobo love it and are surprised that it has no soy sauce. We also cook our adobong baboy until it is dry and the meat is fried to a crisp. Or, in order to save the savory sauce, we take out the meat before the stew dries up. We fry the meat to a crisp, then put it back in with the sauce. I have been taught that if soy sauce is used, the pork will not be crispy. I do not know if this is true because I have never broken the rule, hehe. Note also that lean pork meat is not good for crispy adobong tagalog. Use pork with a good amount of fat in it. I have read it before that adding salt early on in the cooking “drains” out the flavor from the meat. You’re using a new camera.. ?? :) The photos look suberb. LOL The chambas for this entry are super duper chambas. Makes me feel like reaching out and eating the pata on the monitor. Smell a blog. Scratch and sniff monitors. Print and taste pages. Connie, when will all these be? I think Coconut Brand Soy Sauce taste best among all the soy sauce brands mentioned above. I believe this is due to the added flavorings in Coconut Soy Sauce such as hydrolized soy protein (which has a tasty, meaty flavor). The other brands are simply pure brewed soy sauce. Kikkoman has a very aromatic “brewed” winey taste & aroma. I usually mix Kikkoman and Coconut brand to get the best of 2 worlds in all my recipes requiring soy sauce. Knorr liquid seasoning may also be added to have a little zest in the flavor. (but this will mean putting more chemicals in your food). My grandpa (when he’s still alive) usually uses Kimlan Brand thick soy sauce. This soy sauce is thicker & richer than the usual soy sauce, it is also very flavorful. He used it in adobo, pata, etc. by the way, if we read the ingredients of Knorr or Maggi (liquid seasonings), hydrolized soy protein is one of its major ingredients… together with MSG, it really enhances flavors in our dishes!!! Thanks to chemicals. MM, is it ok to use white sugar instead of brown sugar? Honestly, don’t know if that will make a difference. maggie, yes, you can use white sugar, but use less, BUT brown sugar is preferable. If you taste a good muscovado against white sugar, you will see that there is a difference. My goodness! How many versions are there to make Humba? Some looks simple and easy and some are pretty complicated. I just want my Grandmother’s humba, but sadly she’s no longer around. What’s even worse is none from her 6 daughters (including my mom)picked up the recipe. Everyone was so dependent on Grandma’s Humba every sunday. Man!’ the sabaw alone was ulam na! I am guessing that she made hers the most traditional or old fashioned way, and not the “gourmet” fancy wancy way. Now with that being said, which one of you has the old fashioned way of making this. Thank you! Marami pong salamat! 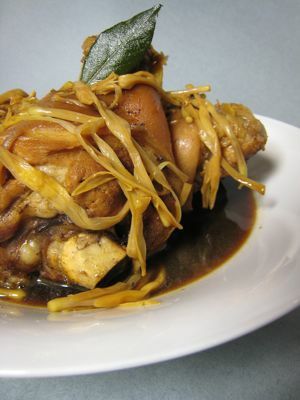 Dean, if you checked the archives, you might have found this recipe for humba, by our cook who is from Cebu… it is perhaps closer to what you are looking for. The pata up top wasn’t meant to be a humba. Good luck with trying to recreate your lola’s version…just keep tinkering. I am cooking it right now. Hey, New Yorker, go to Woodside(Filipino Sore) or chinatown. Like Ted I find the substitution of dried lily buds a good replacement for dried banana blossoms. I find the use of palm sugar (jaggery) gives a richer taste than brown sugar or muscovado. I also add a bit of chinese rice wine.